Life in the Fast Lane . . .
. . . Just Got Faster! 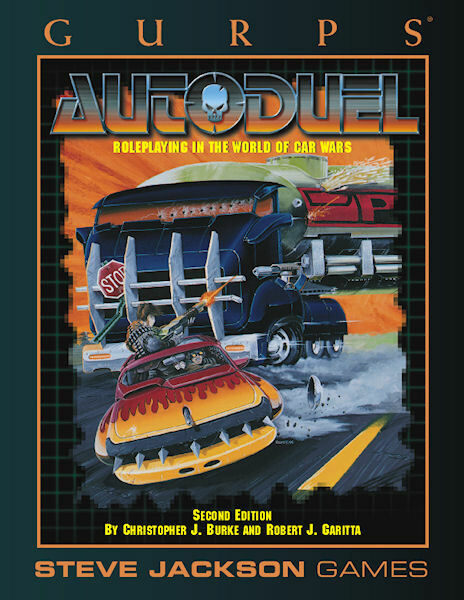 GURPS Autoduel was one of the first worldbooks ever published for the GURPS system – over ten years ago! Its post-apocalyptic world, based on the classic Car Wars boardgame, was a fan favorite as players faced a world devastated by war, famine and despair . . . on lawless highways where the right of way went to the biggest guns. A detailed history and description of "Autoduel America". An updated and expanded "AADA Road Atlas and Survival Guide". Vehicle construction rules completely compatible with GURPS Vehicles Second Edition, with a dozen sample vehicles. Complete character creation guidelines, including guns, equipment and gadgets galore. Loads of campaign ideas for everything from a corporate autoduelling team to a lone wolf vigilante, and more! And Remember . . . Drive Offensively! GURPS Autoduel (First Edition) – The original version of this supplement from 1986.